Two weeks before the London Marathon, we heard from Nick Thomas that he would be running in support of the Trust. For a small charity such as ours the cost of purchasing places is prohibitive and so we were overjoyed with the news. 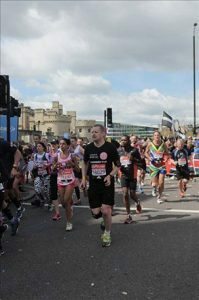 Nick told us, “I ran my third London marathon for the Myotubular Trust in April 2016, 14 years after running my last one. Despite some bad cramp, I made it across the line in 4.48 and resolved never to run that far again! The support from the crowds lining the street was as ever fantastic and despite the pain it was an incredible event to be a part of. 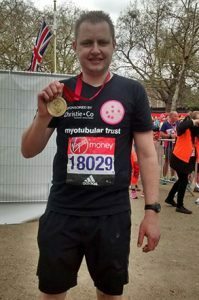 I found out about the Myotubular Trust as it was one of the chosen charities of the year for my employer, The Bank Of England and after finding out more about the charity and some of the families that they help, I was more than happy to run for them and am grateful to my friends, family and colleagues for their kind donations”. We are so grateful to Nick for choosing to support the Trust, and for raising so much in sponsorship. Thank you Nick and thank you to your very generous sponsors too!